Originally published in 1978, RuneQuest Scenario Pack 1: Balastor’s Barracks was the first scenario published for the seminal RPG. In 2016, it was made available again as part of The Old School RQ Source Pack, funded by the Kickstarter campaign for RuneQuest: Classic Edition, the reprint of RuneQuest II. The other parts of The Old School RQ Source Pack include RuneQuest Source Pack Alpha: Trolls and Trollkin, Creatures of Chaos 1: Scorpion Men and Broos, Militia & Mercenaries, and the previously unpublished Scenario Pack 3: The Sea Cave. Nearly four centuries ago, the city of Pavis fell to Troll assault and a great hero, Balastor Brightaxe, the last defender of the Pure Horse dynasty, and Rune Lord and High Priest of the Cult of Pavis, died to allow the escape of a great many people. As much as he is known for his bravery, Balastor is known for his mighty axe which went missing after his death. New Pavis is now occupied by the Lunar Empire and the Imperial government has learned of the axe’s existence and wants it to cement its spiritual hold over the city. Forces fomenting for Pavis’ independence also want the axe and maybe the trolls in the old city want it for their own ends or to stop anyone else from finding it. Anyone who can find the axe will certainly make a name for themselves! This sounds like the set up for an interesting adventure, but Balastor’s Barracks actually turns out to be a fairly light dungeon crawl. The dungeon itself is the underground ruins of the barracks, occupied by mix of the undead, creatures of Chaos like Broos, Gorps, and Scorpionmen, and oddly, Trolls. The latter have set up a base of operations in the barracks in a number of rooms that are quite close to those occupied by creatures of Chaos. What seems odd here is that the Trolls are a tough bunch and it seems unlikely that they would stay there and leave their traditional enemies unmolested. That said, the Chaos opposition is equally as tough and perhaps as yet, the Trolls are not ready to attack? What this does mean though, is that the scenario as a whole is very tough with even the weakest of opposition, the Trollkin, wearing heavy armour. 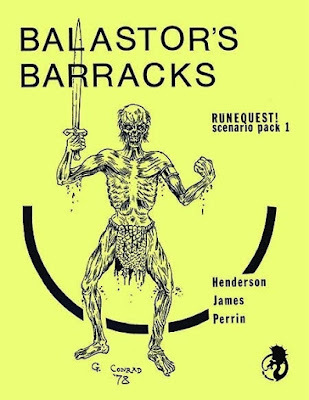 There is no denying that Balastor’s Barracks is a tough adventure ill-suited to beginning characters, which is a little odd given that this is the first scenario released for RuneQuest. The design of the dungeon is relatively light with not a great deal of detail. Where Balastor’s Barracks actually shines is in the design of the treasure to found in its rooms. Not just Balastor’s Axe, which is randomly located in the dungeon, but also a number of other items. These have ties to various cults and factions outside of the dungeon and all will make the player characters’ lives interesting beyond the confines of the adventure. Balastor’s Axe itself will definitely complicate their lives. Physically, Balastor’s Barracks is a plain affair. The writing is clear if plain and the layout tidy enough. RuneQuest Scenario Pack 1: Balastor’s Barracks is not a great scenario nor all that interesting as a dungeon bash. It is typical of its time though, so its flaws should be seen in that context. That said, Balastor’s Barracks is not without possibilities, for in the hands of a good GM who can develop the motivations of the factions involved in the race to get to Balastor’s Axe and so tie it further into the setting and politics of Pavis.